The cackle of snow geese, the sighting of a robin, the melodic call of the meadowlark – all signs of spring! Very welcome signs that we are all longing for after this unusually cold winter! Signs that may lead to put a mark on the checklist. The James River Sportsman’s Club, along with the LaMoure County Soil Conservation and James River Soil Conservation have teamed up to sponsor “Birding Bonanza” – a bird watching competition. The competition starts March 15 and continues until October 29, 1014. The object is simple – spot as many different types of birds as possible in this time frame. This contest is purely on the honor system. No pictures are necessary. The contest is open to LaMoure County and Dickey County residents only or to anyone who is a member of the James River Sportsman’s Club. 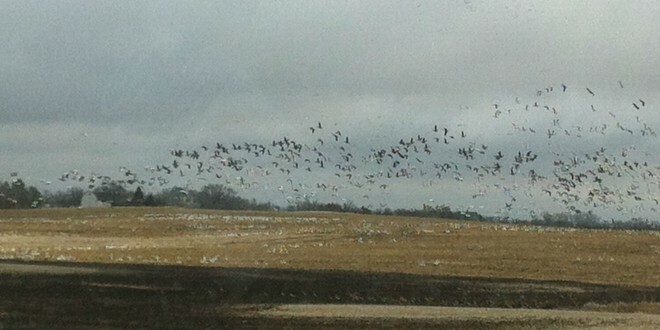 The birds, however, may be spotted anywhere within North Dakota. Not an expert birder? Don’t get your feathers ruffled. The is more than just a contest. It is meant to be a fun adventure to bring you and your family closer to nature. The objective of the bird watching competition is to promote the appreciation, knowledge and conservation of North Dakota’s native birds and the ecosystems in which they live. Those who enjoy watching wildlife are more inclined to be good stewards of the land, promoting and conserving habitat wherever they can for current and future generations. The Sportsman’s Club and Soil Conservation Districts believe bird watching contributes to preservation of the land simply by encouraging outdoor recreation. Birders do not go out to learn about ecology, but they do have an interest in protecting the landscape. If a particular bird is difficult to find, it may be because there is a shortage of the type of habitat they need for survival. In addition, many birders realize that conservation is a chain reaction. When you improve the environment for birds, it also improves habitat for a multitude of other wildlife. An awards banquet is being planned for the end of the competition, sometime after October 29. This may include an educational speaker, awards, and door prizes. Details will be available as the contest deadline approaches. Recognition will be given in six different categories, including those who have seen the most birds and a youth category. So come on! Join one of the fastest growing outdoor hobbies. Bird watching currently ranks 15th in the United States as the most popular outdoor recreational activity, with over 75 million people enjoying our feathered friends. For more information, contact Bob Flath at 701-320-0194. A checklist and field guide will be provided to you, along with complete contest rules and details after registration.